In this tutorial we will install Let’s Encrypt SSL into our website while using cPanel, this will make our website safer and it will be accessible with https://. However, if you are serious about your website protection and don’t want to spend an arm and a leg on bullet-proof SSL certificate check out Hostinger’s cheap SSL certificates for a life time offer. You have successfully entered your cPanel, now you should locate Security section and click on Let’s Encrypt SSL icon. However, if you cannot find Let’s Encrypt SSL, please contact your hosting provider and they will gladly assist you. 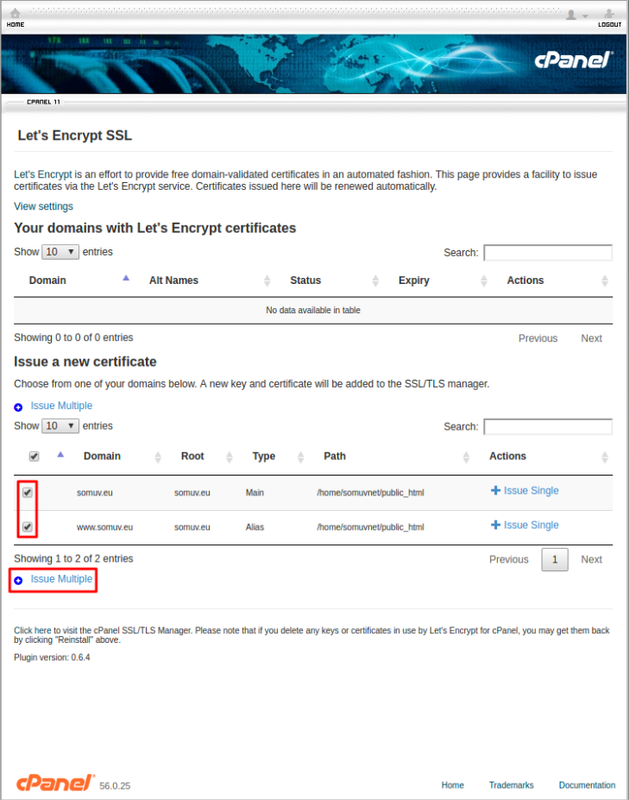 Once you have entered Let’s Encrypt SSL you should check the section Issue a new certificate and tick the boxes near your domain name. After you have done that, please click on “Issue Multiple”. After you have done that, you should tick the box on Primary near the domain without www and tick the box near text Install mail .. SSL certificate for yourdomain.com. If you tick the box near Install mail.., then it will grant the ability to use SSL (Secure Sockets Layer) when transmitting data between mail clients and servers. In other words, this will keep your sent and received mail secure. To proceed, you should press Issue. 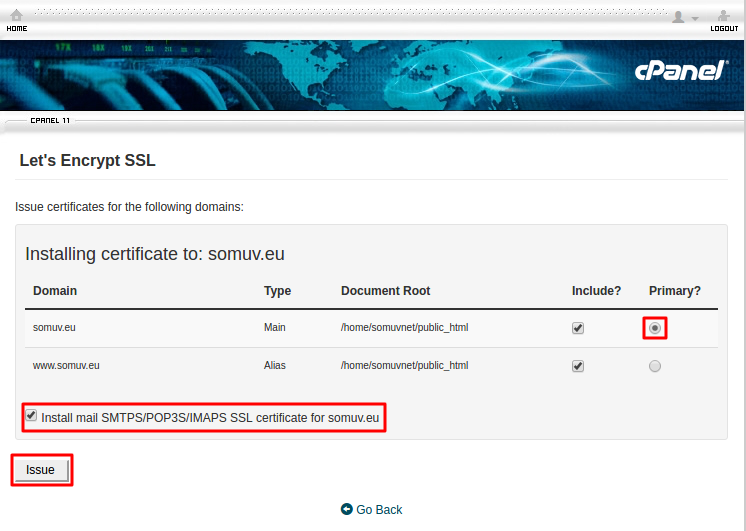 The SSL certificate is now installed onto the domain "yourdomain.com" using the IP address. Apache is restarting in the background. – this message should appear on your screen if everything was correct, after few seconds you will be able to use your website with SSL. If you get an error message instead, simply ask for the assistance of your hosting provider. Congratulations, you have successfully installed Let’s Encrypt SSL certificate, you should be able to access your website with https:// now, this makes your website a safer place! The following method still works, however, Hostinger no longer provides cPanel hosting (which is what this tutorial is about). But we do offer lifetime SSL certificates for a one-time setup fee.